The secret to really great-looking period clothing is having the right foundations. For most periods, that means you're probably going to end up with more layers underneath than in your actual clothes--and that's exactly how it should be! 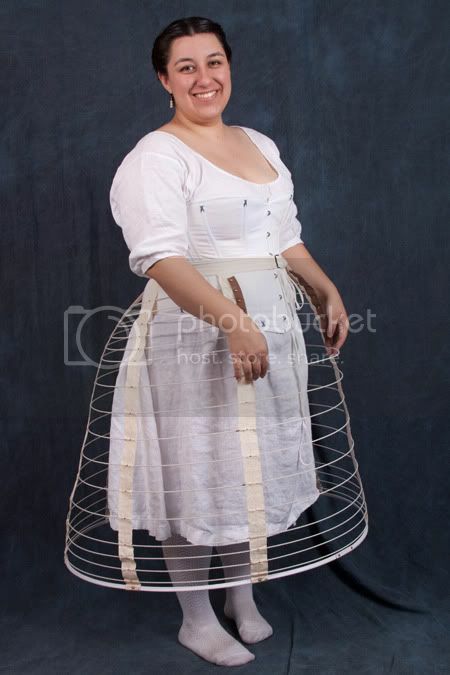 As pictured, my undergarment layers consist of: chemise, corset, narrow-wire cage crinoline, and two petticoats. I used the Laughing Moon corset pattern, the Silverado style. The bust gores are drafted into the body so that I could sew boning channels into each seam without using casings. 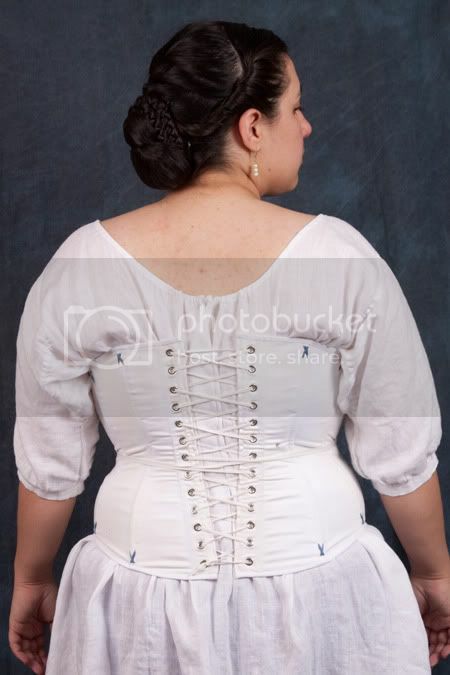 The corset itself is constructed of two layers of cotton twill and boned with 1/4" spiral steel throughout, except for the center back, which uses spring steel. The only embellishment on the corset is some flossing, done in a slate-ish blue DMC floss. The flossing keeps the bones snug in the channels so the corset doesn't buckle and the bones don't twist--decorative and functional! The cage kit came from Needle & Thread in Gettysburg. It's extremely light and easy to wear, and is a fantastic reproduction of originals I've seen. It wasn't too hard to assemble, just fiddly. If I ever wear this one out, I'll most likely replace it with the same style--but I would pay extra to have it assembled by someone else! 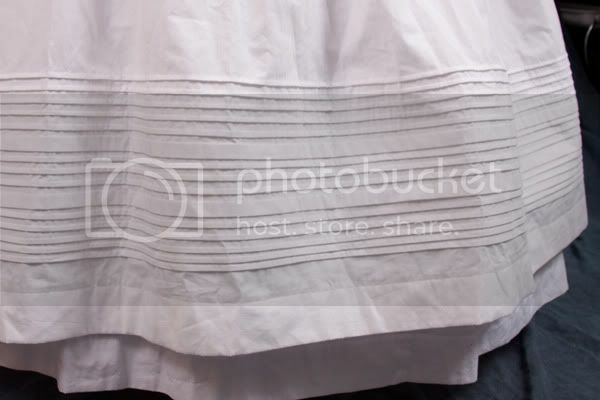 A closeup of the tucks on my outer petticoat. 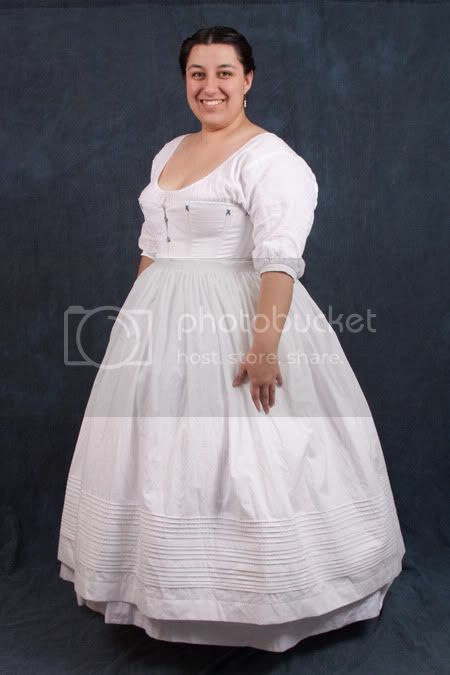 The under-petticoat is made of Pimatex cotton, which has a firm hand and is fairly light. The top one is of Southern Belle cotton, which has slightly more body than the other and is very crisp, even without starching. There are fifteen tucks--mostly 1/4", interspersed with a couple 1/2" for variety--based on an original I saw in someone's private collection. Both petticoats are balanced at the waist, gathered to a self-fabric waistband, and fastened in back with original "pantywaist" buttons that I got from my button-expert friend, Tyler. Photos courtesy of Michael Caterina.